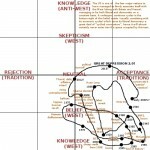 Following my posting of Russia’s Sisyphean Loop, the influential East-Central Europe expert, Vlad Sobell, wrote up an interesting critique at the Untimely Thoughts Russia Discussion Group. It addresses what may be considered some weak, or at least not thoroughly explained, points from the original article, so I thought it would be useful to reproduce it in full along with the ensuing e-mail conversation. I first give a very condensed version (inevitably a caricature) of what he has written, and then proceed to inform him what is wrong with it. 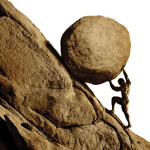 In its effort to modernise and catch up with the West (mainly for reasons of defence) Russia has been going in circles, or historical cycles – a Sisyphean Loop. 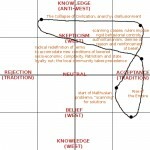 Anatoly has developed a useful model (his Belief Matrix TM) which illustrates the parameters in which this cycle is set. He concludes that Russia is currently at a crossroads: it could either continue the cycle, with the current authoritarianism strengthening (even metamorphosing into totalitarianism) or it could break out from its cycle and embrace genuine liberalism. While this is a very useful analytical framework, it is too deterministic. Anatoly is very good at sticking his neck out on the side of the NEGATIVE outcome, based on his tendency to see History as an endless repetition, rather than progress to something new. Thus he predicts a reversion to totalitarianism and neo-imperialism. However, Anatoly should realize that while history does to some extent repeat itself (and there are structural/geographical causes of this), things ALSO DO CHANGE and evolve. Indeed, change and evolution is a more potent force than eternal repetition. This is why there are different species, for example, and why there is such as a thing as Russia in the first place! (And I do not want to remind Anatoly of the hackneyed statement – usually (but most likely mistakenly) – attributed to Karl Marx, that although history does repeat itself, the first time around it is a tragedy, but the second time a farce). fundamental change and a break out from the cycle. Russia cannot revert to the past because its economy would not be able to take it. Without modernization the Federation would disintegrate, and modernization cannot be carried out on the basis of autarchy. In today’s globalized environment (and in the era of the Internet) autarchy is simply a non-starter. Anatoly makes the mistake of taking the indisputable signs of repetition (e.g. Putin’s strong rule) as a proof of reversion to kind. The evidence for this so far is meager. This is not authoritarianism for authoritarianism’s sake, this is largely a democracy’s defense against oligarchy and demagogy driven chaos. I would also argue that we are witnessing Perestroika mark 2. The system that Putin built has been shown to be seriously wanting by the depth of the economic crisis. Just like in the 1980s this is fueling pressures towards liberal reforms. Thanks for the critique, Vlad. Re-my view of history as cyclical and pessimism. First, I would note that I didn’t really give predictions as much as different possible scenarios. The reason that pessimistic ones figure much more prominently in my work than in some (most) others is because my worldview is fundamentally shaped by the concept of Limits to Growth – the theory that the world system is coming under increasing ecological and resource stress and may collapse in a few decades. Whenever you’ve had strains, you also had popular disillusionment, more support for strongman rule, retreat of globalization and of commercial values in favor of militarism and nationalism, etc. 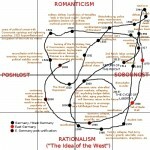 Even though Russia itself is pretty well endowed with resources, the shrinking of the world system may encourage it to move to a more autarkic and militarized form of government (e.g., note that the Great Crash and the Soviet “Great Break” [that marked the genesis of Stalinism] both took place in 1929). In the end, industrialism may just be a passing phase in human history, just one really big cycle [enabled by humanity’s discovery of and exploitation of the fossil fuel windfall], and will centuries later be remembered as some kind of “Age of Myths”. There are two assumptions here: that globalization is permanent, and that autarchy won’t survive in a globalized age. For the former, see above [or my article Shifting Winds]. For the latter, see Brezhnev’s Soviet Union – impoverished, but still a superpower, and one that endured for a generation after the onset of zastoi (and could have theoretically endured for much longer – see North Korea). The Federation itself can’t really fall apart any more, I think, (with the exception of a few S. Caucasian Muslim states) because it is now 80% Russian, whereas in the USSR the figure was 50%. But… one of the biggest reasons, probably the main one, why Russia’s economy fell so hard was because of its loss of access to the cheap Western credit its corporations had come to rely upon, and the primitive nature of its own domestic financial system. To the contrary, this may be interpreted as a lesson to become *less* reliant on outsiders. I cannot take seriously this theory of the limits to growth. I understand the reasoning and there is no doubt that the growth of population is vastly out of line with the availability of all manner of resources (plus the environment damage etc). But instinctively (apart from rationally) I do not like any apocalyptic theories (the same goes for conspiracies). Something always happens, things ALWAYS turn out different, in both positive and negative sense. I also do not accept the global warming – yes there is a lot of evidence and yes it is caused by human activity, but I do not believe that shutting down on industrialisation is the answer, and we do not (cannot) know now what we will know in 10 years from now, never mind 100 years from now. So as you can see I am very sceptical. The market will likely solve these problems – as resources get more scarce, they will get more expensive. This will generate money for the alternatives and will make previously expensive alternatives look cheap. This is how it works. Population growth will slow down – as it does when nations get richer. etc. I am aware of the problem of the Russian economy – it was the inability of the system to provide long-term finance, and hence its foolhardy reliance on external finance. But when they start building a proper financial system, that system will need to be properly integrated within the global financial system. There can be no such thing as financial autarchy these days – hence the same applies to the rest of the economy. Diversification of production, financial flows and hence diversification of risk is the answer. I am not saying that you are completely wrong. There are (will continue to be) forces in Russia pulling in the direction you describe. But they cannot prevail in the long run. As I said, I do not believe that History repeats itself – there are similarities and analogies, but there always are also huge (and material) differences. Every situation is always novel. By the way, I think are one of the most interesting writers on these topics around. I like the way you put together the big picture and your ability to draw your ideas to their logical ends, regardless of how “outrageous” or unpalatable these ends may be. Your stuff always makes me think and look at things in a different way. The markets-and-technology will solve our problems, or a latter day form of cargoism. The problem with rising costs is that they, in essence, translate to higher energy costs – or in other words, a lower EROEI. The minimum EROEI needed to sustain industrial civilization happens to be 5:1, which is probably somewhat equivalent to the overall values for wind (not enough of it to power the world anyway) and solar (can power the entire world, but is still very underdeveloped – even in 2008, photovoltaics supplied less than 0.02% of the world’s total energy supply). There has been no significant action on global warming at all, with emissions increasing at a record breaking rate during the 2000’s as China continued its breakneck industrialization; furthermore, public acceptance of anthropogenic global warming is actually falling, despite the overwhelming evidence for it. Russia will have to do with financial autarky if global finance collapses. It won’t be that difficult, since that has been the norm for most of Russia’s history, with the exception of late Tsarism and the post-Soviet era till now. Readers, please feel free to continue the discussion in the comments below.